This is a scalable context timeline. It contains events related to the event November 1963: South Vietnamese Policies Cause Concern in US. You can narrow or broaden the context of this timeline by adjusting the zoom level. The lower the scale, the more relevant the items on average will be, while the higher the scale, the less relevant the items, on average, will be. 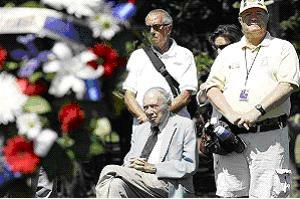 Stanley Karnow, seated, in Washington, paying respect to the first American causalities killed in Vietnam. July 8, 2009. [Source: Chase Martinez / Washington Times, via AP]Richard Holbrooke, US special envoy to Afghanistan, and Afghan war commander General Stanley McChrystal, telephone Stanley Karnow, a Pulitzer Prize-winning Vietnam War historian to discuss the similarities between the two American wars and to seek guidance from the eminent scholar. Holbrooke will later confirm that the three men conferred on the two wars. “We discussed the two situations and what to do,” he will say during a visit to NATO headquarters in Brussels. Karnow, an acknowledged critic of the war in Afghanistan, will also confirm that the discussion was held. “Holbrooke rang me from Kabul and passed the phone to the general,” says Karnow, who authored the 1983 book, Vietnam: A History. He does not, however, elaborate on the specifics of the conversation. The telephone call is made in the context of a reevaluation of American strategy in Afghanistan amidst an escalation in spending, troops, and casualties. President Obama has tasked General McChrystal to conduct a strategic review of the increasingly criticized and unpopular war. Comparing Ngo Dinh Diem and Hamid Karzai - Among the issues voiced by scholars and analysts who draw their own analogies between the Vietnam War and the war in Afghanistan is the credibility of President Hamid Karzai’s government, which is widely seen as corrupt and ineffective. David Kilcullen, a counterinsurgency specialist who the Associated Press reports will soon assume a role as a senior adviser to McChrystal, compares Karzai to former South Vietnamese President Ngo Dinh Diem. “[Karzai] has a reasonably clean personal reputation but he’s seen as ineffective; his family are corrupt; he’s alienated a very substantial portion of the population,” Kilcullen says. “He seems paranoid and delusional and out of touch with reality,” he continues. “That’s all the sort of things that were said about President Diem in 1963.” Ngo Dinh Diem was killed in a US-backed coup in 1963 (see November 1963). Comparing the 1967 Vietnam Ballot and the 2009 Afghanistan Ballot - The Associated Press quotes other analysts who draw parallels between Afghanistan’s presidential election schedule for August 20 and the failed US effort in Vietnam to legitimize a military regime lacking broad popular support through an imposed presidential election in 1967. James McAllister, a political science professor who has written extensively on Vietnam, recognizes why US policy chiefs are looking to the Vietnam War for parallels and lessons, especially with regard to the presidential elections. “That [1967 ballot] helped ensure that US efforts would continue to be compromised by its support for a corrupt, unpopular regime in Saigon,” McAllister says. Rufus Phillips, Holbrooke’s former boss in Vietnam and author of the book Why Vietnam Matters, echoes this warning. “The rigged election in South Vietnam proved [to be] the most destructive and destabilizing factor of all,” says Phillips, now in Kabul helping to monitor the upcoming election.